"I thought of the recipe one morning and served it to my dad...let's just say he licked the plate clean! Serve with maple syrup, peanut butter, or honey...or all three!" Beat eggs, vanilla, cinnamon, and sugar together in a bowl. Place bread into the egg mixture to soak. Heat a lightly oiled skillet over medium heat and brown the slices of bread on both sides. Heat a smaller lightly oiled skillet over medium-low heat and pour the remaining egg mixture into the skillet. Allow the eggs to set in the skillet for 1 to 2 minutes, then continue to cook and stir eggs until scrambled. Place 1 slice of toast onto a plate and top with the eggs. 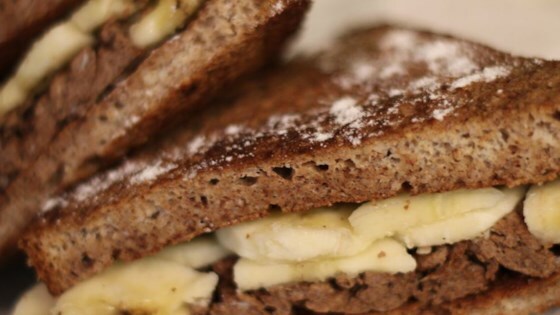 Layer the slices of banana over the eggs, then place the second slice of toast on top to make a sandwich. Seemed a little bland for me. Not my kind of French Toast. A very nice breakfast that was easy and yummy. The cinnamon seemed a little aggressive to me so I cut it in half which worked out very well.